As your site changes, or you change your mind, you can delete pages from your website. Click the page menu, select the page you want to delete, and click the red remove icon. Click Delete to confirm the page's removal. Note: You can delete all pages except the Home page. 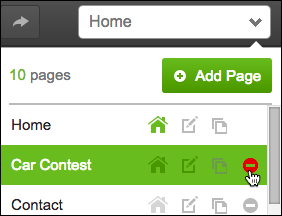 See Organize pages with navigation menus to help customers find your site pages.